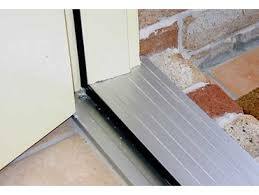 In all weather environment, Pyflex door seals prevent draught and rainwater infiltration through external doors. The amount of sealing required for external doors depend on the exposure of the door and local weather conditions. Pyflex produce a variety of seals to suit even even the most severe conditions. The majority of Pyflex seals can reduce air conditioning loss through a door and improve comfort levels by eliminating heat draught. Its design will stop the ingress of airborne dust, insects, rodents and wind blown embers in bush fire areas.